Moving to a new location is exciting and stressful enough without figuring out all the logistics of packing your stuff. Leave it to the professionals at Southern Cal Moving & Storage in Laguna Hills. We offer top-quality packing and moving services for your residential or commercial moves. We provide precision moving for short and long distances. From the meticulously planned moves to short notice, we have you covered. Our team of experienced and friendly movers will treat your belongings with the utmost care and consideration. We are the movers Laguna Hills residents can count on. Packing Supplies, Packing Services, and Much More! Finding the right supplies to get your possessions from one place to another in one piece is a feat in itself. When you hire Southern Cal Moving & Storage for your move, we will bring everything you need to ensure you have the smoothest moving experience possible. We can provide all your packing supplies, and even pack your belongings for you. We aim to provide exceptional customer service with trustworthy movers in Laguna Hills that will take some of the stress off of your relocation. The infamous Laguna Hills community is an upscale suburban city located in southern Orange County. It is home to many famous faces including Olympic medal winner Chad Carvin and actor Ross Conway. With many five star restaurants, beautiful beaches, exceptional shopping, and short drive to Los Angeles, Laguna Hills is one of the most desirable places to live. 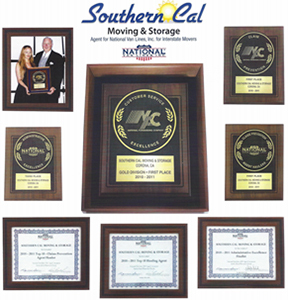 Southern Cal Moving & Storage is happy to serve the great residents of Laguna Hills. When you want the best movers Laguna Hills offers, Contact Southern Cal Moving & Storage or call us at 951-520-8800.